Vijay is known for good Samaritan in him besides being the Ilayathalapathy, a heart throb of many Tamil cinema lovers. In South India, especially Tamil Nadu, it is hard to keep off film personalities from entering into politics. The trend which was jointly started by late Dr. M. G. Ramachandran and M. Karunanidhi has been followed till date. Looks like another famous actor who would want to join the never ending list is none other than our Ilayathalapathy Vijay by forming an alliance with BJP. Remember, Vijay has also met our present Prime Minister Mr. Narendra Modi during 2014 election campaign and extended his support along with Superstar Rajinikanth. There have been talks about Vijay's interest to serve the people of Tamil Nadu using politics as a base but the actor himself has denied it on several occasions. Reports have it that Vijay is planning to start his own political party in January and ties up with Tamilisai Sounder Rajan, BJP's Tamil Nadu unit president. But now the latest buzz is that Vijay's father and a veteran director SA Chandrasekhar has advised Vijay not to join politics at the moment. 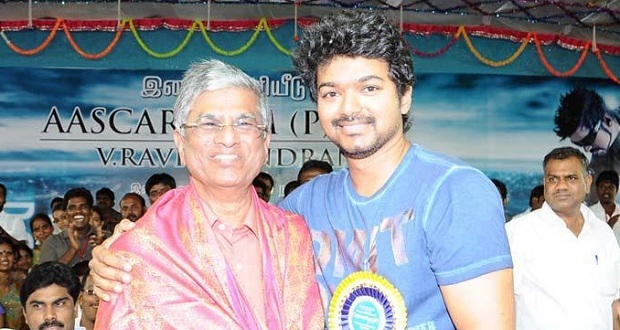 However, Vijay's father, director SA Chandrasekhar has cautioned the actor against entering into politics. According to SAC, Vijay entering into politics now is similar to committing suicide and wanted him to concentrate in making good films till he turns 50, atleast. Fans of Vijay may also be hoping to see their matinee idol on big screens and not in political rallies, for now. Thalaiva has expressed his interest in serving fellow Tamilians by participating in politics. So, Vijay's political entry may get postponed, but cannot be ruled out for sure.